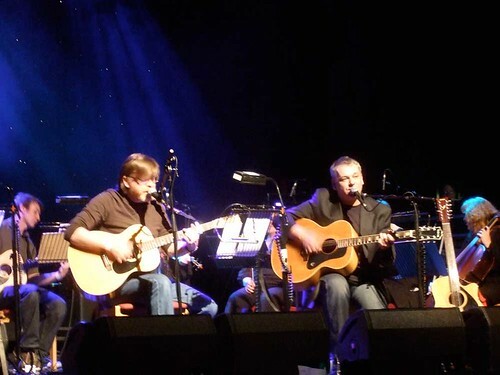 Norman Blake and David Scott, originally uploaded by alister. 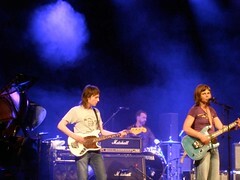 Last Friday saw a great gig at Dunfermline's Carnegie Hall as part of Tigerfest. Not only did we have Teenage Fanclub's Norman Blake joining David Scott of the Pearlfishers we also had one of the first gigs by the reformed Vaselines. The Vaselines are Scottish indie legends. A big part of that is their adoption by Kurt Cobain and Nirvana who covered three of their songs. Several years down the road and Eugene and Francis look like someone's Mum and Dad and are backed by four members of Belle and Sebastian. It's like a Scottish indie royal family. A great set though. Norman and David have a string section which fits nicely with the comfortable seats and excellent acoustics of the Carnegie Hall. 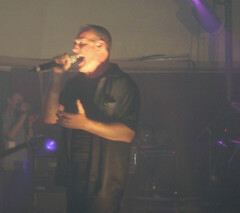 They play a mixture of TFC, Pearlfishers and cover songs with a few solo compositions. My personal favourite being Norman Blake's 'Baby Lee'. 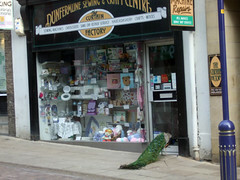 Uh, I also saw a peacock window-shopping. Dunfermline, what a town.